Engine K14-1000a 14 cylinder air-cooled double-row radial, rated at 1000 hp. Powerplant similar in design to Gnome-Rhone. Construction Cantilever low-winged monoplane with semi-monocoque rear fuselage and welded steel tube forward and center sections. 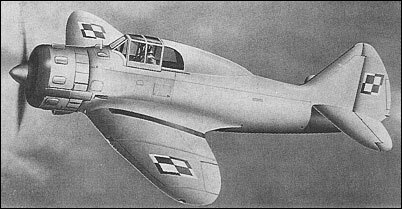 61 to be produced in 1936 as immediate replacements for the PWS P10 fighters. Will also begin to replace the 150 PZL P7s currently in service. To be called the PZL P80. Yep, its the new Polish fighter doctrine. Take out enemy planes by ramming. However, it may prove costly, jk. Note to self: always check before copy and pasting from websites. PZL would like to know what engines Persia wishes to install in the P.23 and P.37. Shouldn't be too much of a problem. How many would Persia like? Is Q3 fine? PZL has to get the engines, and change some things for them to fit.